Francesco Columbu (born August 7, 1941) is an Italian actor, author, former champion bodybuilder and World's Strongest Man competitor. Columbu was born in Ollolai, Sardinia (Italy). Starting his athletic career as a boxer, Columbu progressed into Olympic Weightlifting, powerlifting, and later bodybuilding, winning the title of Mr. Olympia in 1976 and 1981. At 164 centimetres (5 ft 5 in), though shorter than most of his competitors, his height did not prevent him from achieving widespread success. In 1977, Columbu competed in the first World's Strongest Man competition, placing fifth in overall points; a remarkable outing, considering Franco weighed much less than the other competitors. He was forced to drop from competition due to an injury. While leading the "refrigerator race", a downhill race while wearing a heavy, unwieldy refrigerator strapped to the racer's back, Franco stumbled and collapsed with a grotesquely dislocated leg, and aired on national television. After a court settlement, he received a reported $1 million in compensation for his injury. After Arnold Schwarzenegger's comeback victory in the 1980 Mr. Olympia, Franco followed suit and won the 1981 Mr. Olympia. Columbu is a longtime friend of Schwarzenegger, whom he met in Munich in 1965 and against whom he competed in several international-level bodybuilding competitions. For the Mr. Olympia competitions however, he competed in the under-200 lb (90.7 kg) category, whereas Schwarzenegger was in the over-200 lb category. The IFBB has since abandoned weight classes. Arnold and Franco were inseparable friends and training partners during the early to mid-1970s. Columbu served as Schwarzenegger's best man at his wedding to Maria Shriver in 1986. Columbu and Schwarzenegger had been encouraged to come to America by bodybuilding guru Joe Weider in 1969; Weider sponsored them with an $80/week stipend. They arrived in America and began a bricklaying and patio business called European Brick Works in 1969. 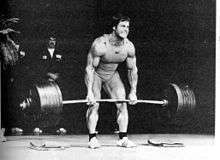 Since 1969, Franco Columbu was considered one of the world's strongest men. He held a number of powerlifting and Olympic weightlifting world records. He performed a strongman act of breaking a hot water bottle by inflating it orally, lifting vehicles onstage while another performer changed a tire, and deadlifted over 320 kg (700 lbs). He designed a comprehensive men's workout in 1988 to flatten the stomach, narrow the waist, and eliminate love handles. As a chiropractor and a weightlifter, his career parallels Karyn Marshall using chiropractic therapy to train for competitions. His TV appearances include The Streets of San Francisco (1977), and Dead Lift with Arnold Schwarzenegger, and TV commercials, most notably Vitalis ("the pump"). In the Arnold Schwarzenegger film Last Action Hero, the words "A Franco Columbu film" appear on the screen at the beginning of Jack Slater IV (a film within the film) as a tribute to Columbu. The "Columbu Terminator" features as a boss character in the Terminator 3 video game. Colombu is a qualified chiropractor, with a DC (Doctor of Chiropractic) from the Cleveland Chiropractic College in 1977. In 2004, Columbu was ordered by the California Board of Chiropractic Examiners to stop claiming he had a Ph.D. in nutrition on his letterhead. In February 2006, Columbu was appointed to the California Board of Chiropractic Examiners by then-Governor Arnold Schwarzenegger in what was later described as a "coup".Columbu's tenure on the Board ended in January 2014. Columbu, Franco (September 1985). The Bodybuilder's Nutrition Book. McGraw-Hill Education. ISBN 978-0809254576. ↑ "Deadlifting For Massive Strength?". deadliftworkouts.com. Retrieved 2016-11-04. ↑ "Franco Columbu Bodybuilding, Height, Stats, Measurements and Video". www.trulyhuge.com. ↑ "World's Strongest Man Index". ↑ "Ahhnold!?". Time Magazine. August 18, 2003. Archived from the original on July 7, 2011. Retrieved 2010-06-11. One crowd that Arnold has stayed with for a while are old bodybuilding friends, a faithful circle that includes Franco Columbu, the Sancho Panza of Schwarzenegger's early days, who says Arnold is running for Governor to give something back to the country that has been so good to him. "He wants to do a big, beneficial thing, more than a movie—like straightening out this problem in California." ↑ "Maria Owings Shriver Wed To Arnold Schwarzenegger". The New York Times. April 27, 1986. Retrieved 2010-06-11. Maria Owings Shriver, the daughter of Mr. and Mrs. R. Sargent Shriver of Washington, and Arnold Schwarzenegger, a son of Aurelia Schwarzenegger of Graz, Austria, and the late Gustav Schwarzenegger, were married yesterday in Hyannis, Mass. ... Dr. Franco Columbu served as best man. 1 2 3 4 5 Mary Stevens (February 5, 1988). "Throw Away The Excuses, Turn On The Vcr And Shape Up". Chicago Tribune. Retrieved 2010-06-11. ...is a comprehensive men's workout designed by two-time Mr. Olympia Franco Columbu. The workout can be used with or without weights and should help to flatten the stomach, narrow the waist and eliminate unflattering love handles. ↑ Ann E. Sudekum, Associate Editor (June 1992). "The Olympics and sports chiropractic: World Champion Weightlifter Studies to Become Chiropractor (page 35 of pdf file; page 37 of numbered journal pages)" (PDF). ACA Journal of Chiropractic. Archived from the original (PDF) on July 20, 2011. Retrieved 2009-10-02. ↑ "Results Plus". The New York Times. July 29, 1989. Retrieved 2009-10-02. ↑ Julie Carft (July 29, 1989). "Image is Heavy Burden - Weightlifter Karyn Marshall Feels Pressure to Project 'Femininity, Intelligence'". Los Angeles Times. Retrieved 2009-10-02. ↑ Staff writer (2010). "Beretta's Island (1993)". The New York Times: Movies. Retrieved 2010-06-11. Beretta (Franco Columbu) is an ex-Interpol agent. Imagining himself retired, Beretta returns to active duty when his friend is killed. His quest for justice takes him all the way to Sardinia. Going undercover, Beretta gets enmeshed in a vicious drug-smuggling operation. Watch for Arnold Schwarzenegger in a cameo. ↑ Staff writer (2010). "The Hustler of Muscle Beach (1980)". The New York Times: Movies. Retrieved 2010-06-11. ...The hero's get-rich-quick scheme gets him into hot water when he selects a most unusual candidate for his protégé. Several real-life male bodybuilders appear onscreen, including Franco Columbu and Frank Zane, but the film's ad campaign focused on the bikini-clad female contestants. ↑ "Board of Chiropractic Examiners Public Session Minutes" (PDF). California State Capitol. January 16, 2014.